Some members of Catalonia’s ousted government will appear before a Spanish judge Thursday for questioning in the rebellion investigation stemming from the region’s declaration of independence, but the former regional president does not plan to be among them. A Belgian lawyer representing the sacked Catalan president said Wednesday he was seeking to have Carles Puigdemont questioned instead in Belgium. Puigdemont turned up in Brussels this week along with several of his former Cabinet members. “He is not going to Madrid, and I suggested that they question him here in Belgium,” the lawyer, Paul Bekaert, told The Associated Press. Bekaert said such an arrangement was possible, but he didn’t know if Spanish authorities would accept the offer. All 14 of the regional officials removed from office by the Spanish government face possible charges of rebellion, sedition and embezzlement for driving the series of moves that culminated in Catalan lawmakers voting in favour of independence from Spain last Friday. 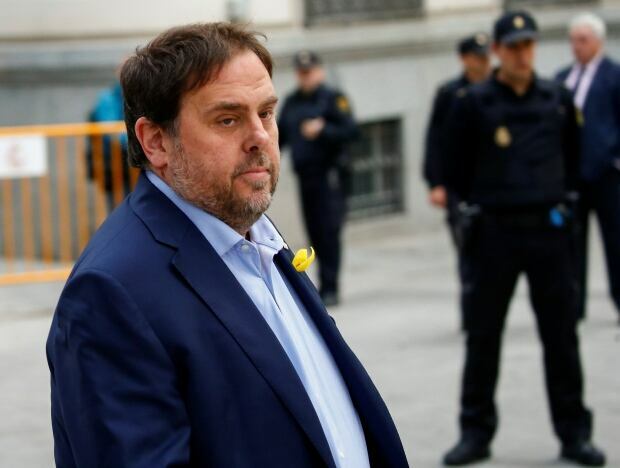 Spain’s chief prosecutor is seeking charges of rebellion, sedition and embezzlement against Puigdemont, his ousted vice-president Oriol Junqueras and another 12 members of the now-fired Catalan government. Convictions carry potential decades-long prison sentences. The legal moves are part of the Spanish central government’s implementation of extraordinary constitutional powers after Catalan lawmakers voted on Oct. 27 to secede from Spain in an escalation of what has become Spain’s worst political crisis in decades. Under that authority, the Spanish government sacked the Catalan cabinet, dissolved the regional parliament and called an election for Dec. 21. The statement described the charges sought by prosecutors as “disproportionate,” saying they were “equivalent to crimes such as murder or terrorism.” The direction of the criminal probe demonstrates “we are facing a political trial brought by orders of the Spanish state,” they said. Puigdemont and other removed Catalan officials intend to remain in Brussels and respond to any criminal charges “according to the mechanisms foreseen in the European Union in such circumstances,” the statement read without elaboration. The 14 have been summoned to appear in the National Court in Madrid at 9 a.m. Thursday for questioning that is scheduled to last through Friday. Separately, another six ousted Catalan lawmakers have been summoned to appear before Spain’s Supreme Court in a parallel investigation of potential rebellion. Nine of the former cabinet members were expected to appear in court as ordered. They include Junqueras, Raul Romeva, who handled the Catalan government’s foreign affairs, and former government spokesperson Jordi Turull. Regardless of who appears in court, an investigating magistrate could issue arrest warrants for any of those under investigation. Bekaert, Puigdemont’s Belgian lawyer, told Belgian broadcaster VTM on Wednesday that if Spain seeks Puigdemont’s extradition, it would be up to Belgian judges, not the government, to make a decision. Pons told Spain’s Onda Cero radio that Puigdemont’s lawyer in Belgium would likely be able to prolong the case until after the Dec. 21 Catalan election. Puigdemont’s decision to go to Belgium instead of remaining in Catalonia was met with mixed reactions by Catalans, not all of whom supported the region’s bid to break away from Spain. Some were angry at what they perceived as a shirking of responsibilities, while others said he had no choice given Madrid’s intention to bring criminal charges against him. In Barcelona, about 100 people rallied at a train station in a show of support for two of the six Catalan parliament members who have been summoned before the Supreme Court. Puigdemont’s Democratic Party of Catalonia said a delegation from the region’s former ruling coalition, Together For Yes, would travel to Madrid to support all 20 ex-government and parliament members summoned before the two courts.